↑ "The Vampire Diaries". Facebook. ↑ "Kevin Accola, M.D. Member Home Page". CTSNet. December 11, 2007. Retrieved August 2, 2012. ↑ Ranchino, Cheryl (December 10, 2010). "Herrin Area United Way accepting donations". Retrieved August 19, 2013. ↑ Boyar, Jay (March 2010). "Back to School". Orlando Magazine. Retrieved March 12, 2010. ↑ "On the Ground in Florida". The New York Times. November 1, 2008. Retrieved April 28, 2010. ↑ MacKenzie, Carina (October 2, 2009). "'The Vampire Diaries' cast off the hook". Los Angeles Times. Retrieved October 17, 2009. ↑ Chiu, Melody (June 21, 2013). 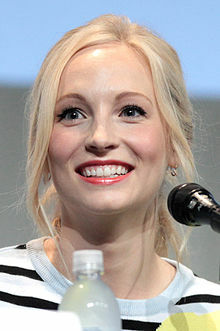 "The Vampire Diaries's Candice Accola Is 'So Excited and Grateful' to Be Engaged". People. Retrieved October 18, 2014. ↑ Corriston, Michelle (October 18, 2014). "Candice Accola Marries Joe King". People. Retrieved October 18, 2014. ↑ Saad, Nardine (August 31, 2015). "Candice Accola of 'Vampire Diaries' is expecting first child with the Fray's Joe King". Los Angeles Times. Retrieved August 31, 2015. ↑ Kimble, Lindsay (January 25, 2016). "Joe and Candice Accola Welcome Daughter Florence May". People Magazine. Retrieved January 25, 2016. ↑ "Movies & TV. Pirate Camp (2007)". Amazon.com. Retrieved November 28, 2012.